When it comes time to travel with your pet in your pickup truck, there are some safety issues and concerns that you need to be aware of. The last thing that you want to happen is that your pet gets injured or lost while traveling with you. Here are some tips for hauling your pet in a pickup truck that will ensure his safety. Your pet should never ride in the back of your pickup truck because you will not be able to properly restrain them. 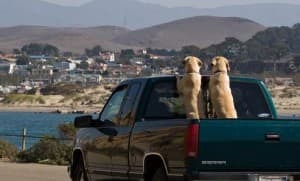 Each year in the United States alone, hundreds of pets are injured and killed because they were not properly restrained in the back of pickups trucks. No matter how big or how well trained your pet is, he should never have free reign in the back of the pickup because too many things can go wrong. A sudden slam of your brakes to avoid an accident, an animal near your truck and flying debris are all unexpected events that could cause severe harm to your pet. Having them up from in the cab of the pickup ensures that they will not only be sure and restrained, but that no unexpected issues can cause them harm in the open bed of the pickup. When you have your pet upfront with you, utilizing pet seat belts, pet carriers, and pet crates are the best way to keep your pet safe and secure. Many states now have laws in the books forbidding pets to be in the back of pickup trucks. Your pet should already have tags on them, but if they don’t, this is the time to make sure you pet has identification on their collar. When traveling with your pet, there are many situations where your pet could get free from the pickup and run loose. Accidents happen all the time with pets who were able to get free of restraints and run loose in a parking lot, or the crate door was ajar, and when you opened your door they ran after another animal. Pets get lost all the time, and making sure your pet has an identification tag will ensure not only will he be easily identified, but that you will reunite with them much faster. For obvious safety reasons, you pet is now riding up front with you in the cab of the pickup truck. There are still some safety tips you need to follow to protect your pet during the ride. You know that your pet thinks that sticking their head out the window is the best part of the trip. Unfortunately more pets are injured each year by flying debris, that could simply be avoided if they are not allowed to have their entire heads out the window. Leave the window cracked for air flow, but never allow them to have the window all the way down.